Did the 70 years begin in Neb's 1st year? In the last chapter we described how the Bible clearly teaches that the 70 years of servitude to the King of Babylon begin with Jerusalem's destruction. However, promoters of 587 ignore this or callously explain it away. Instead, they hold to 587 as the date of Jerusalem's destruction, but find some other event around the year 607 which would begin Judah's “serving” of Babylon. That way, they don't have to say the 70-year prophecy failed. If they cannot find some event of servitude to mark the beginning of the 70 years, they would be forced to argue that the Bible's prophecy failed, and that's a poor way of drawing people out of the truth. Unfortunately for them, there is no outstanding event in the secular chronology which is 70 years before the exiles returned home. Or is there? However, what if Daniel wasn't talking of the third year of vassal kingship, but was talking about the third year of normal reign in Judea? If that's the case, then in the secular chronology Daniel and other Judeans were taken in exile to Babylon in the year 605 BCE. That's roughly 70 years before the exiles returned! That's certainly good enough! From this they can argue that the 70 years of servitude began then. –See chart the chart to see how this looks chronologically.
) However, to make their reinterpretation fit, the apostates are forced to invent this new, earlier, occasion when Nebuchadnezzar takes away exiles – in his 1st year. So, they argue that their secular chronology is still correct in saying that Jerusalem was destroyed in 587, but the 70 year prophecy was still fulfilled. They say the 70 years of 'servitude' began in that year when the first batch of exiles were supposedly taken, in Nebuchadnezzar's 1st year, which corresponds to Jehoiakim's 3rd year. However, one cannot simply artificially invent an extra exile that took place before all the others, without it causing some serious contradictions in the Bible narrative. First of all, it doesn't truly fulfill the requirements of the 70 year prophecy. Not only is Jerusalem inhabited for 20 years into it when the prophecies said otherwise, but if we count from 605 BCE to 537 BCE when the exiles returned home, that is only 68 years of “servitude”, not 70. This interpretation manages to prove itself wrong before the word 'Go'. If this were a better and more correct explanation than 607, why does it immediately create an inconsistency? If it is the truth, why does it not harmonize more than 607 does? —For more information, see Appendix E.
Besides, if there was an exile in Jehoiakim's third year, as they claim, the Bible repeatedly contradicts such an idea. As we can see, Jeremiah lists “all the souls” taken, yet does not mention any that are taken during the invented exile in Nebuchadnezzar's 1st year, the 3rd year of Jehoiakim. Why? Probably because the apostates have simply created the first exile in their heads, and it never happened in the real world. If it really did happen as claimed, then we must ask why it does not harmonize with this scripture and why Jeremiah makes an incomplete list while wrongly calling it a list of “all” exiles. There are further problems. Several passages in Jeremiah totally contradict the idea of an extra exile in Jehoiakim's third year. is set during the fourth year of King Jehoiakim. According to the apostates, shortly before that time, Jerusalem was put under siege, the King was possibly taken to Babylon in chains before being returned as a vassal King, that exiles were taken away, and some of the temple utensils were also removed. That was the supposed start of the desolation (sorry, I mean servitude). The apostates claim that during the year the above was written, Babylon had already come against the land. It's rather odd how the prophet mentions none of that. On the contrary, he seems to be emphasizing that warnings have been given for the past twenty-three years, and no one listened or paid attention. It seems no one will believe Babylon will ever come. Besides, Jeremiah warns in verse 10: “And this land must become a devastated place”. Yes, the foretold seventy years of devastation had not begun yet. So if the 587-based theory is more accurate than 607, we wonder why this inconsistency in the narrative is created. Surely, if it were true, it should harmonize rather than contradict? Jeremiah wrote another account during the fourth year of Jehoiakim. Does that support the idea that exiles had already been taken? No. So this is the forth year of Jehoiakim's reign – the year after the fictitious first exile. Yet, according to this Bible passage, nothing has yet happened. No punishment, no calamity has arrived. Jehovah is still “thinking” about bringing calamity upon them. Additionally, some apostates claim that Judah was desolated, leaving Jerusalem relatively untouched. Yet, Jehovah says “perhaps the house of Judah will listen to all the calamity that I am thinking of doing”. Jehovah does not tell them to look at the calamity that has taken place on Judah, warning Jerusalem that the same will happen to them. No, the whole “house of Judah” needs to take the warning seriously. Once more we are compelled to ask: if this first exile really happened, why is it causing such disharmony with the narrative of events? Another account, a year later, still doesn't provide any evidence that Judah was already desolated. So, this is the fifth year, and “all the people” of Jerusalem and “the cities of Judah” come to celebrate a religious festival. We've already covered the fact that the cities of Judah were supposedly destroyed two years previously, according to the apostates' fictitious first exile. Yet, here are the people coming into Jerusalem from their cities to observe a religious fast. I wonder where they had been for the previous two years? Perhaps where the Bible says they were, in “the cities of Judah”! Additionally, they argue that many nobles and sons of royalty (princes) were also already taken to Babylon in the fictitious first exile. So why does his account continue to tell us that “all” the princes are in Jerusalem? God's inspired word the Bible tell us that “all the princes” were present in Jehoiakim's fifth year of reign, and it even names many of them for us. If the exile mentioned in Daniel chapter 1 had already taken place two years earlier, as claimed, then how come “all the princes” and “all the people” are in Jerusalem? Daniel 1 says the Babylonians took “some of the sons of Israel and of the royal offspring and of the nobles”. Daniel's account also shows us how they remained in Babylon for three years of training. Yet, two years later (supposedly), here they “all” are in Jerusalem! The reason is obvious, no exiles were taken in Jehoiakim's third year. The princes are afraid of the words, but the King and his servants merely burn the scroll and thought nothing of it – and no wonder, because Jerusalem and its princes have not yet been attacked or carried off to Babylon. The King can't believe Babylon would do such a thing. No, for Babylon has not yet come up against them. He's not even a vassal to Babylon yet. Yet certain apostates would have us believe, that between one and two years earlier the city was sieged by Babylon, conquered, had some of the temple utensils taken away along with various exiles, and even the King was taken away in chains as prisoner to Babylon, but quickly returned to the city as a vassal King (with no precedence for this at all)! How odd that the narrative doesn't even seem to allude to it. Perhaps it's because it didn't happen. Yet if those things did happen, why did the King feel no dread? Why did Jeremiah not remind the King of his close-shave? He doesn't hold back from reminding Zedekiah of Jehoiachin's exile in later years. Again, why doesn't this explanation cause more harmony in the narrative if it is true? —Please see our chart showing how the 607 chronology fits perfectly with the Bible narrative of the Kings and their reigns. The ancient Jewish historian Josephus also confirms that there was no exiles taken in Jehoiakim's 3rd year. Although his book isn't part of the Bible, his account of the event does fill in some of the blanks and agrees with the Biblical account. During the reign of King Jehoiakim (many years prior to the destruction of Jerusalem), Judah became a vassal Kingdom to Babylon. After three years as his vassal, King Jehoiakim rebelled against Babylon and stopped paying his tribute. This led to Jerusalem coming under siege by the Babylonian army. According to Josephus, he put up no resistance and allowed the Babylonian army into the city, hoping for a peaceful resolution. Unfortunately, Nebuchadnezzar had other ideas. He killed King Jehoiakim, took some of the temple utensils, and a few thousand exiles. Nebuchadnezzar then placed the former King's son on the throne, in place of the rebel. However, after a few weeks into his journey home to Babylon, Nebuchadnezzar worried that the son may, too, rebel. He sent messages back to his army still in Judea, ordering them to siege Jerusalem. When Nebuchadnezzar himself returned there, the new Judean King surrendered to the Babylonians immediately. More temple utensils were taken, along with even more exiles. All of these events happened within one year. 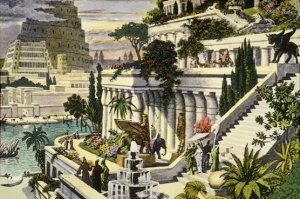 The prophets Daniel and Ezekiel were among the exiles to be taken to Babylon in that year. To read Josephus' actual account of these events, and how the Biblical texts fully agree with his report, see Appendix D.
Why did everyone forget about the 1st exile? If an exile took place in Jehoiakim's 3rd year / Nebuchadnezzar's 1st year, isn't rather odd that there is absolutely no account of it by Jeremiah or any other Bible writer? Furthermore, why isn't there a single clay tablets or ancient document recording the event? On the other hand, there are an abundance of Biblical and secular references to exiles and temple utensils being taken in the 7th/8th year of Nebuchadnezzar. 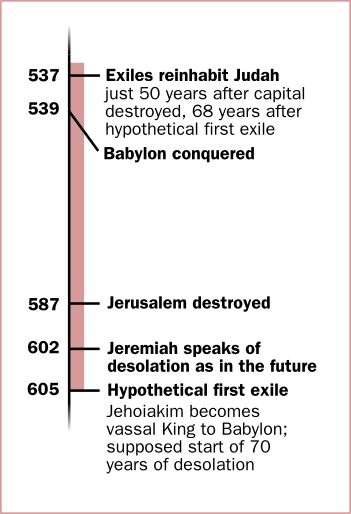 Also, the only time exiles are mentioned in Babylon is after the rule of Jehoiakim has ended, not once before. How mysterious that amongst all of the prophecying and warnings that Jeremiah gave to Jehoiakim, he never once recalls any exile having taken place then(!). Yet, he held nothing back in reminding Zedekiah of the exile during Nebuchadnezzar's 7th/8th year when Jehoiachin was taken. The situation is especially odd as the 1st exile is supposedly the crucial start of the 70 year prophecy, and the fulfilment of all the prophecies of Jeremiah, Isaiah, and other prophets. Further, the 1st exile is strangely forgotten when a summary is given of all the exiles. Yet again, only the exiles in the 7th, 18th and 23rd years are mentioned. The 1st year remains absent. That is not all, the stories about the events in both 2nd Kings and 2nd Chronicles mention the exile of Jehoiachin (Jeconiah), but again mysteriously forget to mention that all important first exile, during the rule of Jehoiakim after his ruling of Judah for only 3 years. Additionally the prophet Ezekiel only speaks of the exile that took place when Jehoiachin went into exile, but never once mentions the exile of the Jews, like Daniel, supposedly taken in the first year of Nebuchadnezzar. He even calls it “our exile” — and he even mentions Daniel at one point in his writings, but never speaks of his being taken at an earlier date. Neither Jeremiah, nor Ezekiel, nor Jehoiakim, nor the false prophet Hannaniah, nor Ezra who wrote 2nd Chronicles, nor Zedekiah, mention this supposed first exile that occured in the first year of Nebuchadnezzar. Not even one time do they mention it. Amazing. Yet, above there are quoted almost 10 places where the exile of Jehoiachin in Neb's 7th/8th year are mentioned. Were they trying to hide it from us? Did everyone have amnesia? Or did it even happen at all? The Bible shows the answer to that latter question to be a resounding No! The first exile never occured — it only exists, and has only ever existed, in the minds of those who would ‘correct’ the Bible to make it fit with incorrect secular chronology. That is why is does not harmonize with the scriptures. Its clear that apostates are wrong to claim that exiles were taken in Jehoiakim's 3rd year of Judean rule. When Daniel said “in the third year of Jehoiakim” he was obviously speaking from the perspective of Babylon's control over the Jews, meaning in the third year of Jehoiakim's vassal Kingship to Babylon. says, “In his days Nebuchadnezzar the king of Babylon came up, and so Jehoiakim became his servant for three years. However, he turned back and rebelled against him.” It is no mere coincidence that the vassalship lasted “three years”. Yes, three years of vassal Kingship ended in rebellion, and a crushing defeat for King Jehoiakim. That is when the king died and exiles were taken. Thus, Daniel says “in the third year of Jehoiakim”.
. Many passages in Jeremiah directly contradict the idea. People are mentioned still living in the “cities of Judah”, and “all the princes” are still there. The King himself seems to scoff at the very notion of Babylon coming up against him. The inspired book of Jeremiah seems to also forget to mention the event in his list of “all” the exiles. The ancient historian Josephus also denies it happened, and it is easy to see that Daniel was speaking from the perspective of Babylon. It is no coincidence that he said the King rebelled and exiles were taken “in the third year of Jehoiakim”, when the book of 2nd Kings says his vassal Kingship was exactly three years in duration before his rebellion. This fictional first exile simply never happened. Thus, the claim that the secular chronology is right, and that the 70 year desolation began in 605 BCE with this mythical exile, is groundless. If it really were true, it would be an important missing part out of the puzzle, and it would make everything add-up. Yet rather than answering many questions and clearing up any complications, placing the event in the narrative causes nothing but problems and bizarre inconsistencies. On the other hand, the 607-based interpretation has none of this effect. Besides, even if it was true, counting from 605 BCE to 537 BCE only adds up to 68 years – not 70. There is no Biblical evidence for an extra exile. Passages in Jeremiah contradict the theory. Adding the extra exile creates much disharmony in the narrative. Daniel must have been speaking from his Babylonian perspective. The apostate theory only adds up to 68 years. There is no secular evidence of the first exile.